On today’s show we are talking about what we have been up to to the past 2 weeks, sharing some funny stories. Listen in for our Love Summer series, plus some listener feedback from the mail drop. Join the conversation. Ok ladies, if you were in Jacksonville we introduced you to Fitness expert Kim. Kim along with our relationship will Billy Blanks and Team TaeBo, will be our key sources for developing our Health Corner. We created a website months ago that tracks our progress (or presently lack there of) over at Marathon Moms. We want you to join us. We are training to get in shape. Maybe you have 10lbs to loose, maybe you have over a 100, wherever you fit into that mix we want you to join us. You can follow our stories via the blog and even track your progress along with ours. I’d like to add at least 3 other women to our group. If you are serious about losing weight, getting in shape, training for a road race or similiar join us! 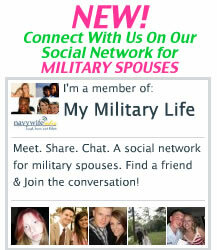 Email me at wendy(AT)navywiferadio.com if you’d like more info on joining us on the fitness blog. If you already have a fitness blog, email me and we’ll add you to our blogroll. One of the keys to success is accountability. So, lets all band together to live a healthier, more energetic, and active life!